​The eastern islands of Indonesia offer a glimpse into the past - an area of villages largely untouched by modern life, of communities that continue to follow ancient traditions and tropical getaways discovered by only a privileged few. ​The bustling town of Kupang is the gateway to West Timor, locally known as Palau Timor, and is serviced by regular flights from Bali. The tropical island of Alor, off the eastern tip of Nusa Tenggara, can currently only be reached by air from Kupang. 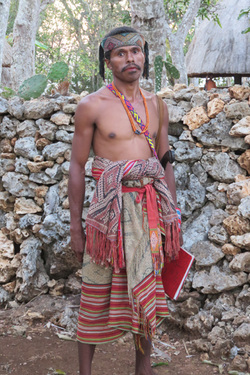 ​The range of accommodation around Alor and West Timor is limited and, in some villages, very basic. However, you will find the warmth and hospitality of the people second to none. ​West Timor and Alor have two main seasons - the dry season being April through November and the wet season being December through March. Average daily temperatures are fairly consistent throughout the year, ranging from 28 °– 32°C. Travel is not advised in the months of January and February due to heavy rainfall making some roads impassable. We visited Alor and West Timor in 2014 with our children, aged 10 and 13, and their grandparents aged in their 70s. Whilst in West Timor, we felt especially privileged to be welcomed into our guide's family and community and to experience the authentic way of life there. Click on the sample itinerary below to view a suggested family tour for this destination. This is based on our own travels but can be amended to suit differing ages, group sizes and duration. Accurate travel times, accommodation and guide details will be provided once your personalised itinerary is confirmed.